Something old is new again? 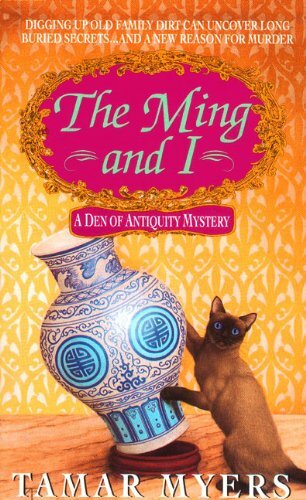 Maybe not - The Den of Antiquity Mystery series is a definite pass. Abigail Timberlake is a whiny character without the charm and wit of Tamar Myer's other character Magdalena Yoder from the Penn Dutch series. But if you're looking for a brain break this will do. 3rd in the series. Part of a delicious RABCK box of Cozies sent to me by the very generous vraciousrdr - will be passing this one along via dancing-dog's Virtual Cozy Bookbox! affinity4books - on its way to Texas! Thanks for passing this one along! It's my first to arrive from the bookbox. When I'm done I may share it with my mother who loves antiques. This was my first book by Tamar Myers and I'd like to read some more of hers when I'm in the mood for a light mystery. I enjoyed it quite a bit, especially since I was recently visiting North Carolina where the book is set. The relationship part wasn't very realistic, and some of the characters seemed a little too stock cutesy like CJ's storytelling. However, it was humorous and kept me turning pages on the airplane. Maybe I'll try her other series next time. Taken out of Affinity4boks' Mystery Bookbox. Looks like a fun read! This was a quick, fun read. Lots of zany characters and humourous dialog. Gave to my sister to read and release. Released for the 2007 Keep Them Moving release challenge. My sister left me this book to read. Will read soon.